Stocking up your kitchen for the very first time? Or maybe you’re just sick and tired of your cruddy old culinary tools, like that plastic spatula with that melted front edge. It’s time to level up! Having the right cooking implements on hand can mean the difference between having dinner ready in a flash and being frustrated and defeated in the kitchen. In this episode we’ll tell you all about our favorite tools. And don’t worry—we won’t recommend anything crazy expensive, or any one-trick ponies that’ll clutter your countertops. We won’t even suggest any items that require electricity. 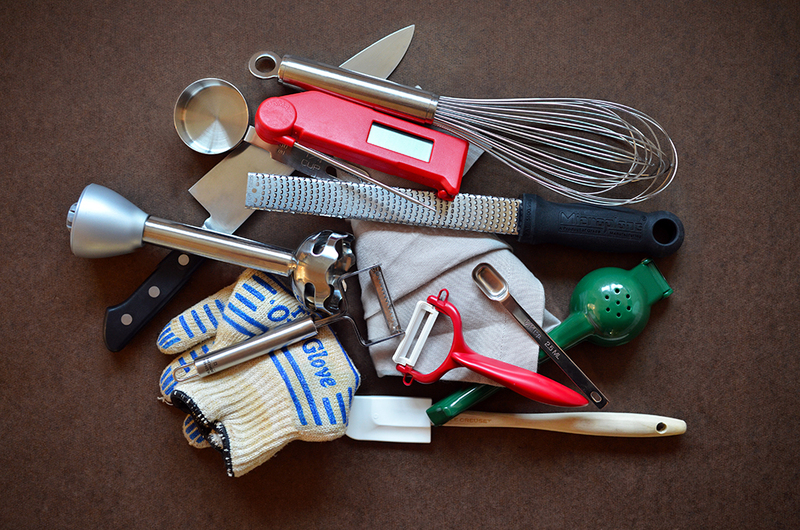 Listen in and we’ll let you know which kitchen tools we can’t live without! For complete show notes, links, and recommendations, go to our podcast archive and read about Episode 10. A great way to impress a dinner guest—or treat the dad in your life for Father’s Day!—is with a perfectly cooked steak. Still, a high quality steak can be expensive to purchase, so the last thing you’ll want to do is mess it up during the cooking process. But don’t worry: I’ll teach you how to cook the perfect steak! 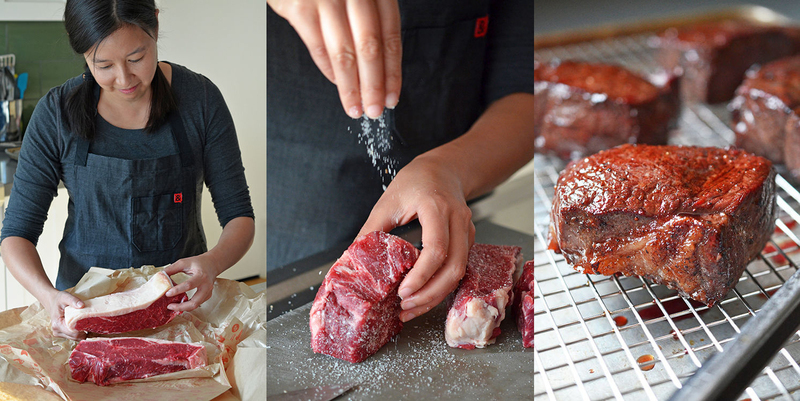 I’ll go over the best cuts to buy and the foolproof cooking methods you’ll need to know to sear your beef the right way. Ready to tackle the perfect steak? In this episode of the Nom Nom Paleo Podcast, we’re gonna shake things up a little bit. 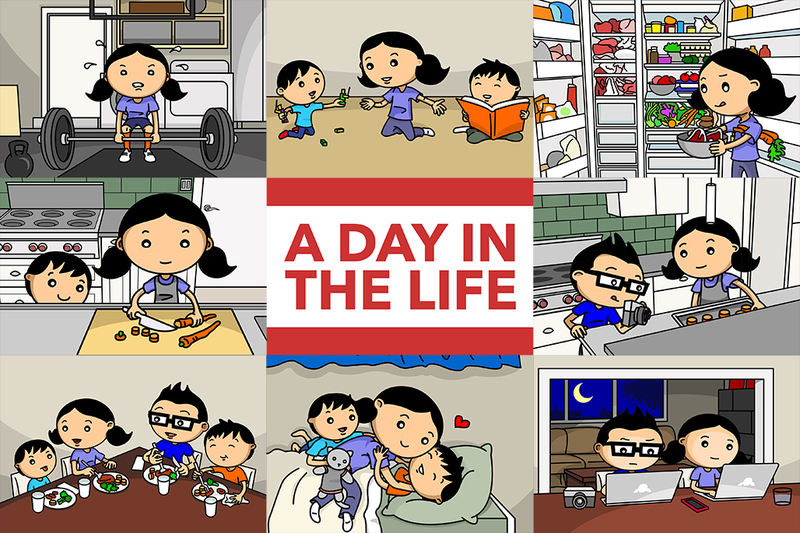 Instead of the usual format (which involves sitting around our dining room table and marching through different segments), we thought we’d drag you through a typical day in our lives—from the time we get up in the morning to when we collapse in bed at night. It’s not that we think we’re super-interesting people. The opposite is true, actually. But when we asked you, our listeners, about what you’d like for us to cover on this podcast, one idea that came up more than once was going through a day in the life. For our cookbook, Henry drew me a comic about a day in the life of a zombie drug dealer – in other words, me, or at least me a year ago. That’s because at that time, I was working as a full-time night shift hospital pharmacist. In other words, I was a professional drug dealer. However, ever since I quit my night job about a year ago, our lives have changed a lot—and it’s about time we provided an update to reflect what our life looks like now that I’m a full-time mom, cookbook author, blogger, home cook, app creator, podcaster, and whatever else it is I do.